Caol Ila is one of the biggest distilleries on Islay, cranking out almost boundless amounts of peated whisky for Diageo's blends. This means that it's also the most common Islay whisky to make its way into the warehouses of Scotland's independent bottlers. 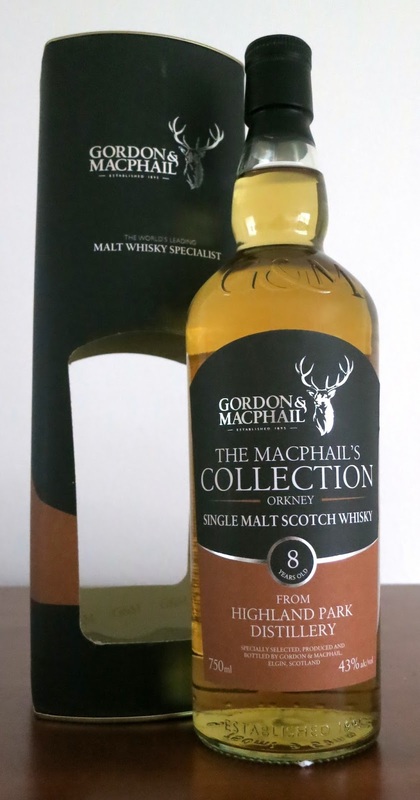 This one comes from Gordon & Macphail, one of the biggest and oldest independent bottlers in Scotland. The whisky was distilled in 1998 and bottled in 2009 at 45% from two casks. Thanks to Joe Lorigo for the sample. Taste: wine is present throughout, malty sweetness undergirds everything, transitioning into smooth caramel, followed by a burst of dry oak and peat near the back. After dilution, the wine becomes much more prominent, though it remains relatively dry, there's an acidic pop alongside the oak at the back, and some vanilla comes out as well. I think this is a good example of what Caol Ila's peat can be. It's less aggressive than many others on Islay, but still has a great richness. The madeira finish is a bit odd - it actually reads more like some of the red wine finishes I've tried before rather than other fortified wines like sherry or port. It works fairly well on the nose, but doesn't seem quite fitting for the palate. If the peat had come in earlier and more aggressively, it might have worked, but as it stands the oak was doing most of the heavy lifting in terms of keeping the wine in check. The combination of bubblegum and vanilla with peat in the finish is more than a little strange and might be what tips me towards not wanting a whole bottle. Water seems to bring out more of the wine to the exclusion of peat, so I would lean towards leaving it neat. In a lot of ways I might have been happier if this had been released as an unfinished bourbon cask, especially if cranked up to 50% ABV. This isn't a bad finished whisky per se, I just don't find it particularly compelling. Hakushu is Suntory's second single malt distillery, located in the forested hills below Mt. Kaikomagatake. Built in 1973, it produces a wide range of different spirits using both peated and unpeated spirit run through a dazzling array of different pot stills. This has come about because Japan's different whisky companies are much much closed than their Scottish counterparts, forcing them to produce all of the different whiskies needed for making blends 'in house' instead of trading casks between distilleries. 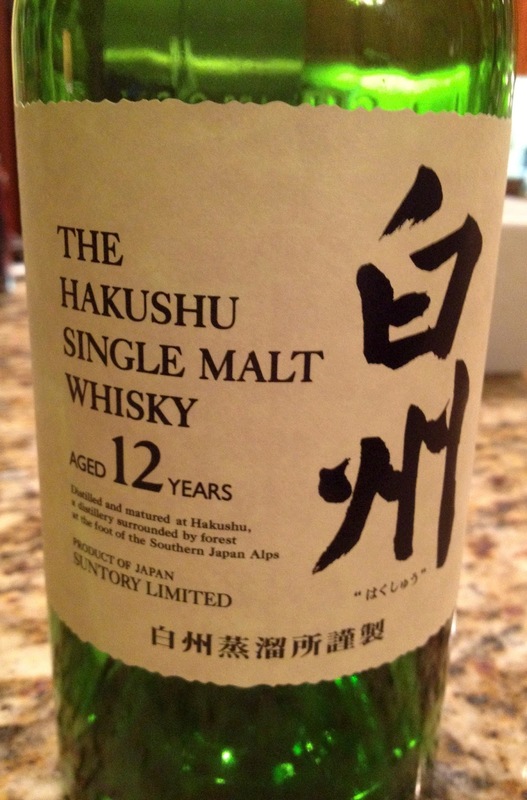 Hakushu 12 Year is put together from a mix of unpeated spirit aged in ex-bourbon and ex-sherry casks along with a smaller amount of peated (25 PPM) spirit aged in ex-bourbon casks. The spirits are married together and cut down to 43% with local water before bottling. Many thanks to Ian of PDXWhisky for the sample. Nose: malty and sherry savory notes dominate, vanilla syrup, berry compote, green fruits (apples, pears), light vegetal peat and green tea, polished oak, very creamy, floral esters, a touch of barbecue sauce. After adding a few drops of water, it becomes much more ester-focused, with tons of ripe fruits (peaches, pears) balanced by vegetal notes of peat and used tea leaves, and drier oak, while retaining a malty core. Taste: very peppery and sweet throughout, green fruits (apples, pears) and berry esters come in just behind, oak comes in strong from mid-palate with some caramel until it fades near the back, giving way to very mild peated paired with malty/sucrose/floral sweetness. After dilution, the structure of the flavors remains largely the same, though the sweetness is a bit more syrupy and yet restrained, the fruits become riper, while the oak provides more counterbalance. I will have to admit that I find this whisky to be a little bit too sweet. It almost tastes like some straight table sugar got dumped in, though I'm sure it's just the spirit and casks. The nose manages to strike the right balance between malt sweetness and oak tannins, but the palate is a bit too much of a rollercoaster, with huge sweetness front and back, with balance only achieved in the middle. More oak or peat on the palate would help a lot, though I can see why this style would be appealing to a lot of people. Water helps, but doesn't quite tip the scales far enough for my taste. Given that a significant amount of Japanese whisky is consumed as mizuwari or highballs, as with frozen blender cocktails, more sweetness may be necessary to achieve the proper balance with significant amounts of dilution. I feel like this is an excellent example of the good/bad vs. well crafted/poorly crafted debate. I can tell that this whisky is extremely well made and probably accomplishes the goals that were set out for it; there's no way that I can say that it's bad, it just doesn't fit my own tastes. It does, however, make me very tempted to try the more heavily peated expression of Hakushu, which might be just the thing for me. Sadly they're also wicked expensive ($150 for an NAS bottle is more than I can swallow), so I'll have to take a pass for the time being. Every year on Ardbeg Day, June 2nd, since 2012, Ardbeg has released a special bottle as part of the festivities, following on the heels of their previous Committee bottlings. This was to extend Ardbeg's Open Day, as part of the Fèis Ìle festival, worldwide. Galileo was released in 2012 as a second limited edition whisky alongside the eponymous Day. This whisky is composed of 1999 vintage casks that used to contain either bourbon or sweet marsala. It was bottled at a decent, but not too hefty, 49% ABV. Nose: cheap apple juice, dry peat dust, round wine notes, mixed vegetables, dry malt, vanilla, bourbon cask caramel, floral/ester-y, berries. After adding a few drops of water, there is a shift towards the lighter floral/ester/vanilla notes, with a decrease in peat and wine, and a bit of chocolate comes out. Taste: apple up front, sweet cream of wheat dominates throughout, very mild wine cask notes (growing a bit with time), peat barely makes itself known, a fair amount of alcohol heat, and oak tannins - the combination of which seems to hit me the wrong way. After dilution, the sweetness is significantly ramped up, the ex-bourbon casks make themselves known at the beginning and end, and the marsala gets a bump in the middle, while the peat fades almost to oblivion. Overall, this feels like Bill Lumsden poked around through Ardbeg's warehouses, found a number of casks that had aged just to the point where the new make notes had faded, slapped them in ex-marsala casks for a bit, then called it good. While not precisely bad (though the finish is kind of off-putting), there's nothing inspiring about this whisky that makes me think it deserves to be a special release with the associated price tag. No wonder there are still so many bottles left on shelves. Unlike Ardbeg Day and even Ardbog, there seems to be little to this one other than a hyped-up story. What do marsala casks have to do with space? If the idea was to commemorate the aging process, why not keep it simple and do a 100% ex-bourbon release, some sort of hyper-10 Year? I'm guessing whatever wood got sent up wasn't some kind of fancy wine finish, so why go that route other than force of habit? I think everyone would be a lot happier if they just went through the warehouse, pulled out some nicer casks, and put them together. No need to get fancy, just deliver something demonstrably better than Uigeadail. In the vein of High West's Campfire whiskey, a blend of bourbon, rye, and single malt whisky, I tossed together a Canadian 100% rye with a heavily sherried triple-distilled single malt. Let's see how this goes. Taste: flat up front, expanding into the Hazelburn's sherry, then fading through rye grain and spice. After dilution it becomes sweeter and more integrated - the rye comes forward while the sherry extends further back - while the agriculture notes of malt and rye grain become more prominent, alongside dry pepper. Not sure if this one suffered because it was constructed from the dregs of both bottles, but it didn't have the pop that I was looking for. I think the combination of rye and sherried whisky offers a lot of promise, so I'll keep experimenting with them. Gordon & MacPhail are one of the oldest independent bottlers in Scotland, which means that they not only have access to single casks purchased from the distilleries, but also have long-standing contracts with distilleries around the country to fill new make spirit into their own casks. Thus, unlike many bottles from independents, this one does not have a vintage date, being composed of refill ex-bourbon and ex-sherry casks that have matured for at least eight years before being proofed down to 43% and married for bottling. Nose: fairly light overall, moderate sherry presence - roughly an even split between danker notes and lighter ester-y notes, floral/smoky peat, malt underneath, surprising amount of alcohol presence, some youthful green notes, vanilla, savory, a touch of bacon. After adding a few drops of water, it becomes a lot maltier, with more integrated and dank sherry plus stronger peat, and a certain mineral quality emerging alongside growing savoriness and more heathery floral notes with time. Taste: not particularly dense flavors, sherry influence, a thin layer of peat, and a moderate amount of oak throughout, malt and more peat show up at the back. After dilution, the sherry disappears quickly after a flash up front, it becomes noticeably flatter overall, but the diminished sherry gives more contrast to the peat at the back, though it is somewhat brightened by a burst of pepper near the end, alongside less than entirely pleasant malt notes, with some banana notes hanging around everything. Bad news first - this can't hold a candle to Highland Park 12 Year. They clearly come from the same distillery, but this one is weaker in every respect except for ABV. Even for a whisky composed from a mix of bourbon and sherry casks, the sherry is a less significant presence than one might expect - either the refill casks used for this whisky must have been filled a few times before, soaking most of the wine out of the wood, or the relatively brief time that it was aged wasn't enough to extract much of the barrel into the spirit. With that said, while this was clearly made to be a budget single malt, it mostly delivers for the price. It's positioned to compete with blends and does admirably at the task. In a lot of respects, I think it would actually be a great malt for people who are looking to dip their toes into the world of peated whisky - the peat is present, but hardly overwhelming. To a degree, this is surprising, as the intensity of peat tends to wane with time and this is significantly younger than the much smokier OB 12 Year. But it is what it is. If there's at least $15 between this whisky and the OB 12 Year in your local market, then it's worth giving G&M some of your money. Much less than that and I'd stick with the better whisky. The Exclusive Malts are a product of the Creative Whisky Company. While not a large presence in America, they have partnered with K&L Wines to offer a number of single cask whiskies. This particular whisky was distilled in 2002 and bottled in 2013 from cask #20098 at full strength - 56.3%. Thanks to Michael Kravitz for this sample. Nose: huge new make notes of green malt and plastic, sour decaying vegetation, pine needles, low tide seashore, raspberry esters, ripe cheese, play dough, cedar, burnt cinnamon. After adding a few drops of water, it shifts towards the malt and grainy character, with the seashore notes becoming a bit more pleasant, but the new make character still lurks in the background, and the woodier notes retreat, leaving a fairly simple nose overall. Taste: simple malt sweetness running throughout, unpleasant new make notes of plastic, pine, and green vegetation, strikingly bitter oak with new lumber character (tastes like a small cask - one more reason it seems like craft whiskey) that moves in and out of focus - and eventually dominate the palate, peat is present - but barely - at the back. After dilution, the palate is completely overwhelmed by the bitter new oak - there just isn't much else left. This is Bowmore? As Florin noted in the comments on Michael's review, it tastes like craft whiskey. And not in a good way. I seriously do not know what's up with David Driscoll's (and every other K&L staff member's) sense of taste, but it's clearly different than mine. Quite glad to have had this from a sample, because it's just not an enjoyable whisky. Some of the nastiness receded after the sample had been open for a while, but it never turned into anything I really want to be drinking. Maybe it'd get better if I had a whole bottle to go through, but even if I was sure that it would improve, I'm not sure how I'd push past the unpleasant parts to get there. Diageo regularly puts out 'Distillers Editions' of their standard range, which are all whiskies that have been 'extra matured' in some kind of wine cask. I've covered Talisker's a couple of times before, but this is the first time trying one from another distillery. The DE from Lagavulin gets extra time in Pedro Ximénez sherry casks, which is a particularly sweet form of sherry made from sun dried grapes. Thanks to @JCL1118 for the sample. Nose: something rubbery hangs over all of the odors, jammy fruit, juicy raisins, mossy peat, undercurrent of dank sherry, a touch of bacon (more with time) and something floral, malt buried under everything else, with a growing cedar note over time. After adding a few drops of water, the sherry retreats a bit in favor of mossy peat and greener notes, with more oak and malt, plus a touch of vanilla and salt. Taste: sherried sweetness that waxes and wanes across the palate, peppery oak comes in strong mid-palate then slowly fades, some of the apples I found in Lagavulin's new make (but with an unpleasantly sour edge) near the back, peat waits until the back to show up. After dilution, the tastes become much flatter, while the sherry retreats and tucks inside the oak but the peat holds strong, with significantly less complexity overall. While I found that this one improved over multiple tastings, it never presented what I would consider to be a compelling package. If you want sherry, the standard 16 Year doesn't lack (at least for the time being). Here the balance feels like it has shifted too far and the spirit has almost lost its fight with the casks. There are those who enjoy it quite a bit more, so don't take my word as final, but, especially considering the extra price that the DE commands over the standard 16 Year, it will not be finding a place on my shelf. The big news at Bruichladdich in 2012 was their sale to Rémy Cointreau, a large drinks conglomerate. This was shocking to many in the whisky community as the reborn Bruichladdich, after it was purchased by Mark Reynier in 2000, had styled itself as 'fiercely independent'. However, Remy's deal was simply too good to pass up for the numerous investors who had sunk money into the endeavor. The big question after the sale announced was whether Remy would influence the distillery, pushing them onto a new and more corporate path. Would there be changes in their lineup? Now we know the answer is yes, though not in the way that many assumed. Over the last few months, visitors to Bruichladdich's website began to notice that mentions of their age-dated expressions, notably the 'Laddie 10', had been pulled or listed as 'sold out' on their web shop. Rumors began to fly on Twitter that Laddie 10 had been discontinued, but were talked down by the official Bruichladdich Twitter account. Now there is semi-official word that Bruichladdich will not be offering their age-dated expressions outside of the on-site distillery shop, with the exception of a few Port Charlotte bottlings, the latest of which is travel retail-only. So the Twitter response was correct in that it is not being discontinued per-se, but availability will be nil after current stocks disappear from store shelves unless you're willing to trek out to Islay. How did this happen? Essentially, it seems that there just isn't enough whisky in the warehouses to keep up with demand. It has been suggested that the Laddie 10 was actually a vintage release, reflecting the barley used in 2001. Even Laddie Classic, which is multi-vintage and presumably contains younger whisky, is only listed for sale as a 200 mL bottle on their own website. The new 'core' releases appear to all be NAS or younger vintage releases of the various barley experiments, e.g. Scottish, 100% Islay, or Organic. This suggests that not all is well in Laddie Land. I think the most bothersome aspect of all of this has been the lack of communication. There was no formal announcement, which has led to the rumor and speculation. If there isn't enough stock to fill demand, say so, instead of quietly removing information from the website and hoping no one was going to notice. I didn't hear a peep about any changes to the lineup when I visited the distillery last September. The Laddie 10 was still being poured for samples and everything seemed to be going swimmingly. They certainly wouldn't be the first distillery to drop most of their age statements, so why the stealth? In this day and age of whisky scarcity, it's absurd to think that no one would notice changes to the website or decreasing availability of their age-dated products. There are too many eyes to miss those kinds of changes. Why not get ahead of the rumors and state the situation clearly? Adding to the situation, this should have been completely predictable. Bruichladdich knows exactly what is in their warehouse and the age of every cask. Demand for the new Laddie 10 was certainly high, but it wouldn't take a whole lot of math to predict the difference between supply and demand once orders started rolling in. And given the date of the distillery's sale to Remy, the conglomerate had to know that this was on the horizon when the purchase was made. If they didn't, that suggests a rather poor level of due-diligence. And this is exactly the kind of situation that customers were worried about after the sale - a perceived drop in quality as age-dated whiskies are removed from the market. While Remy assured everyone that they would be hands off and let Bruichladdich manage itself, this seems like a pretty major lapse in judgement. Ultimately, we'll have to wait and see how this plays out within the whisky community. I don't get the impression that this news has been thoroughly disseminated, given that there has not been a formal announcement, so it may be a while before it really sets in. In the meantime, if you happen to enjoy Laddie 10 or any of the other non-core releases, buy them now, because once the distributors are out, they're out and there's no telling when or if the situation will change. After almost two weeks in Scotland, I was simultaneously becoming burned out on distillery tours (you can only see so many mash tuns before they start blurring together) and lack of familiar faces. My original plan had been to ride from Islay to Oban, then up to Mull, before heading back to Glasgow. However, a number of my friends had recently moved to London, which gave me a great excuse to change those plans. The most amazing part of this was my ability to turn on a dime - I was able to cancel both of my B&B reservations by email (which thankfully didn't incur any charges) and book tickets from Glasgow to London via Scotrail, all while poking at my iPhone in my room in Ballygrant. I was a little bit scared by my new plan - it required linking together three stretches of biking, three ferries, and two trains with a fairly small amount of time in between each. Thankfully I was able to settle my bill the night before and arrange to have a few sandwiches made up for me, which were left at the front desk with my bike for me to pick up in the morning. The ferry left Port Askaig, about four miles away, at 7 AM sharp, so I was up and out the door by 6:30. Thankfully it wasn't doing much more than sprinkling while I pushed down the road in the pre-dawn darkness, carefully easing down the steep descent to the ferry terminal. Thankfully I made it with a bit of time to spare and purchased tickets for the three legs of my journey that would be provided by CalMac. 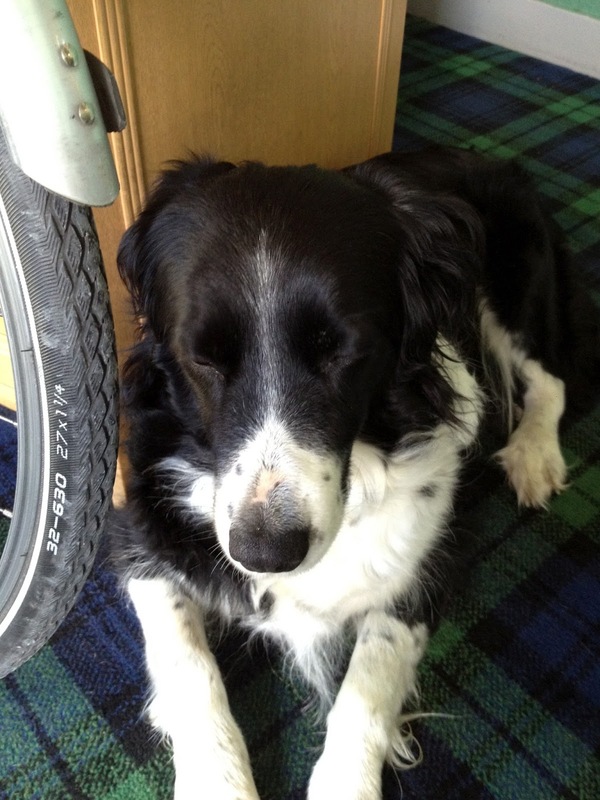 After securing my bike on the car deck, I trooped upstairs for a hot Scottish breakfast. I had a couple of hours to relax and let the calories work their way into my body as I prepared for the next part of my trip. The sun was up but the rain had set in by the time I rolled off the ferry at Kennacraig. It was a fairly short hop to my next destination of Claonaig, but it required going over the hilly spine of the Kintyre Peninsula. I was fairly energized from breakfast, but the hills presented something of a grind, especially since I was quickly soaked by the rain. The descents were also a bit worrying, since I was never quite sure how well my brakes would work, but I eventually found myself at the tiny landing at Claonaig and was able to sit down and rest in a shelter for half an hour or so. The ferry eventually emerged from the mist and pulled in to shore, so I was once again able to lash my bike to the deck and hunker down inside. This was the reverse of the trip I had taken a little over a week before and the passage was thankfully just as swift. We soon docked at Lochranza, where I threw on some extra rain gear and prepared myself for the longest ride of the day. I was sad to have to pass by the Arran Distillery as I would have loved to stop by for a dram, but I was more than a little worried about making the next ferry as I knew how much work it had been going the other direction. It didn't take long after hitting the first big hill above Lochranza to start feeling how much I had lost over the last few days of being sick and not eating enough. My legs just didn't have the oomph that I had started the trip with, which made the going even harder. Near the crest, I ended up slowing down to chat with a Frenchman who was walking the same route that I was taking. We had a good talk, but eventually I had to press on. It was an absolute relief to start descending into North Sannox Burn as I knew the going would be much easier from then on. The road was almost entirely flat as I hit the coast again, which was made all the better by the rain letting up. I stopped to shed my rain gear and continue on. As I got closer to Brodick, it became a race as I could see one ferry leaving the dock and the one I wanted to catch coming in. I reached the dock with a huge sense of relief as the ferry was pulling in just as I rolled into the town. The downside was that it was also running a bit late. I knew I had to arrive at Ardrossan on time to catch the train I wanted back to Glasgow, so I grew increasingly anxious as the minutes drew on. I was also fairly wiped out from pushing so hard across Islay, so I was very thankfully to get a bowl of mac & cheese on the ferry to refuel. After that I unceremoniously flopped on a comfy bench to wait out the rest of the trip. I was itching to get off the ferry as soon as we touched the dock, as there were only a few minutes left by my reckoning to catch the next train. I dashed to the station, but no luck. I was somewhat crestfallen, as the subsequent train would not arrive for nearly an hour. However, this made me extremely thankful that I had been unable to reserve a spot in the baggage car for my bike on an earlier London-bound train from Glasgow, which gave me an extra hour of wiggle room. Eventually the Glasgow-bound train did arrive and I was able to get on my way. I was once again somewhat anxious, as I knew this would not give me a lot of time to get off the train, get my ticket, and get on the train to London when I arrived at Glasgow Central. It was also slowed down by the fact that ticketing had been impossible on the train to Glasgow, so I was slowed by having to pay at the station behind everyone else who was also trying to get on their way. Thankfully I was able to get my ticket printed and find my Virgin Train with a few minutes to spare. It was finally possible for me to relax a bit. I had done the nearly impossible and it was just a matter of waiting. I ponied up for internet access on the train, which let me get in touch with my friends in London to let them know that I was on my way and to pass the time while the Scottish and English countryside slipped by. I finally got into London a bit after sunset, then set out to navigate the London streets to find my friend's apartment. It was a little disconcerting to be surrounded by so many cars and people after more than a week in the Scottish islands, but I successfully found where I needed to go. After a bit of texting and a much-needed shower, the motley collection of folks all trooped off for late night Japanese food. I had a full day of London ahead of me, so sleep was not too long in coming after dinner. One of John Glasser's main goals is to make whisky drinkers rethink their attitudes towards blended whisky. One of the most recent efforts has been the Great King Street line. Named after Compass Box's address in Edinburgh, the goal has been to make blended whiskies that are both high quality and reasonably priced. A significant part of this has been increasing the malt whisky content - the basic Artist's Blend is almost 50% malt whisky, which is much more than most of the blends on the market today. The GKS New York Blend was a limited release put out in 2012 that honored the first branded whisky sold in America in 1894. Unlike the lighter Artist's Blend, this one is big and smoky, with 25% of the recipe composed of peated whiskies, most of them from Islay. The malt component is also rather high, with only 20% grain whisky to round out the contents. As with all of Compass Box's whiskies, it is not chill-filtered and the bottling strength is a very respectable 46%. Nose: moderately heavy dirty/vegetal smoke with a strong undercurrent of creamy malt/grain, caramel, and vanilla, hints of berries and sherry, plus something floral, brown sugar bacon comes out with time, great savory/sweet balance. Taste: peat and pepper come in almost immediately and build in intensity towards the back, underneath is a solid layer of sweet, creamy grain, something minty, and a bit of vanilla, with light oak and chocolate near the back, becoming sweeter with less peat but maintaining a savory quality overall with time. I honestly cannot recommend this whisky enough. It's the perfect blend (heh) of Peat Monster's smoke and the creamier flavors of Oak Cross. While there is plenty of smoke, I find this much more enjoyable than Peat Monster, because it has a lot more going on than just peat. The touch of grain whisky and heavy reliance on first-fill casks give it plenty of sweetness without going overboard. If I was going to speculate about the provenance of the peated whisky in the mix, I'd go with a mix of Laphroaig (dry and ashy) and Ardbeg (oily and salty), with a reasonable dose of Ledaig and peated BenRiach (both pretty vegetal) as well. Even if I'm totally off base, it's a great mix of peated whisky styles. Fundamentally this is just an enjoyable whisky to drink. If you want something with depth and nuance, this has it. If you want something tasty that you don't have to think about too hard, it has that as well. If you can still find it for under $60, I would grab at least a bottle, if not several. I'll be stocking up because I know this is one I'll want to come back to when my current bottled it finished. Ledaig doesn't get a lot of love. The heavily peated malt from Tobermory, the Isle of Mull's single distillery, it has only one official bottling, a 10 Year that I quite like. Even independent bottlers don't seem to get casks of Ledaig too often, so options are thin here in the States. So when Michael Kravitz offered me a sample of a very young, sherried Ledaig, I jumped at the opportunity. Then he dropped a review, which was, to put it mildly, less than flattering. It sounded like a hot mess, so I was a bit scared to try it, but my curiosity won out in the end. This whisky is bottled at a volcanic 64% ABV after maturing briefly in a sherry cask from September 14, 2005 - July 2012, without chill filtration or color. Nose: beautiful dry mossy peat with a smoky edge that makes me remember the smell of peat fires in Port Ellen, meaty/sulfury (in a good way), farmy notes, bittersweet chocolate, malt and wood integrate to form one warm whole, light fruity sherry (more with time), salty/maritime. After adding a few drops of water, the nose is almost overwhelmed by rich earthy notes like freshly turned soil, the peat becomes even mossier and retreats a bit, there is more pronounced saltiness/maritime influence, some kirschwasser notes pop out, and the meatiness becomes salted bacon. Taste: the high proof gives the flavors and almost ethereal quality, significant amounts of cask strength sweetness throughout, shifting into dry peat, a big thump of sherry, then leaving with moderate amounts of sawdust-y oak, some farmy/sulfur-y notes, and more peat. After dilution, the flavors are less ethereal, the sweetness is somewhat tempered up front, but comes back with vigor near the back, the sherry is less obvious, while alcoholic heat is, if anything, even more pronounced, and the peat becomes earthier. It may be because my sample came from the last third of Michael's bottle, but I have to say that I *loved* this one. Unlike a lot of younger whiskies, I don't get any hint of new make from it. While the oak influence is relatively weak, it's more than made up for by the washes of mossy peat, which are perfectly accented by the sherry. Even better, this one plays pretty well with water. For better or worse, I think bottles of this one are long gone. And the price was pretty high to begin with - the lowest I've seen on the internet was ~$90, which is an awful lot for such a young whisky. But even still, if I could find a bottle for under $80, I think I'd grab it. I liked this one so much that it'd be worth the money to me. I don't know that this one would appeal to a very broad audience, but it hits just the right spot for me. My last full day on Islay was, to put it mildly, gorgeous. I also had nothing planned except a tasting at Caol Ila in the early afternoon, which, after the combination of being sick and rushing around for the previous couple of days, was very, very welcome. I had seen signs for Finlaggen Castle not far from where I was staying. So, after tucking into breakfast, I took a walk down the road. The gravel road wound up from the highway, slowly wending behind some low hills. I had to carefully cross an number of cattle grids, which were a bit treacherous on foot. Additionally, the road was liberally scattered with sheep droppings, which were, if anything, even worse. The offending sheep were also present and the bleating they raised as I passed by, especially from the rams, was eery and alien. Thankfully they all got out of my way, but it didn't seem like a sure thing. The vista that opened up was simply stunning. I can see why the Lord the Isles decided to build his castle on the spot. Finlaggan is a gorgeous loch surrounded by low green hills. The castle itself is built out on a small island close to the lakeshore. While in ruins now, I can imagine that it was a much more impressive sight hundreds of years ago. I wandered down to the visitor's center, which was closed, and then proceeded back down the road. While the air was still relatively cool and the breeze made it a bit nippy, walking in the bright summer sun felt absolutely divine. After getting back to the Ballygrant Inn and collecting my bike, I rode out the few miles to Caol Ila. The distillery is only a few miles from Port Askaig, on a small bay looking out across the Sound of Islay to Jura. The weather started to get a bit dicey, so it was a nice time to slip inside the visitor's center. Unfortunately the distillery was undergoing a refurbishment while I was on Islay, so I was unable to get a proper tour. However, it was interesting to see the stills in the process of being rebuilt. It's unsurprising that the place needs some work, as their production has roughly doubled in the last ten years, going from 3.5 million liters in 2002 to 6.5 million last year. This is a huge amount of spirit, but the demands of Johnnie Walker are never-ending. I was, however, able to try some of their whisky in one of the old warehouses (most of their spirit is shipped by tanker truck to the mainland for filling and aging). The Premium Tasting included their standard 12, 18, and 25 Year expressions along with the new make spirit, an Unpeated release (14 Year, I think? ), and a very special sherry cask. I can't give you detailed tasting notes, just general impressions. The new make was very piney, with hints of peat and plastic. While not as bad as Bowmore's, it wasn't particularly enjoyable. The 12 Year was basically the same as I remembered it. The 18 Year was an improvement, but it was hard for me to find much more in it. Thankfully I'll get to retry it under less hurried circumstances soon, as I bought a Caol Ila Collection, which contains a small bottle of the 18 Year in it. The 25 Year was up next, but again, it just didn't quite tickle my fancy. The unpeated Caol Ila tasted like it was from first-fill ex-bourbon casks. It was alright, but tasted mostly like a very smooth barrel proof bourbon. Not bad, just slightly unremarkable. The last up was a 24 year old first-fill sherry cask with a very strange story. If I remember it correctly, the cask was found in a corner of one of the warehouses where whisky destined for the Bell's blend are kept. There were no records of the cask, which was highly suspect as the regulations surrounding alcohol are very tight. This led to a suspicion that the warehouse staff had been attempting to steal it back in the late 1980s, but chickened out. Thankfully the staff at Caol Ila were able to get it shipped back to the distillery. The Premium Tasting is the only way anyone gets to try it - none of the cask will be bottled and when it's gone, it's gone. I've never tried anything else like it. Again, I don't have precise notes, but I was struck by how well the distillery character still shown through the sherry. After my tasting at Ardbeg, it was clear how much first-fill casks can overwhelm even very peated whisky, so it was a pleasant surprise to find that this one was very balanced. The sherry had taken up more of a savory mode, rather than being a fruit bomb. This worked very well with Caol Ila's herbal smoke, planting it in the same league as the 1983/2012 Duncan Taylor I tried last year. After the tasting wrapped up, it was time to pack up and head back to Ballygrant. The climb back up to the main road was a bit rough, especially because it was starting to periodically rain again, but I didn't mind too much. I took it easy for the rest of the day and went to bed early, because I had a long, strange day ahead of me.